Drive back the Daedra from a burning Bosmeri city. Whisper Grove has been turned to a City of Ash by the forces of Mehrunes Dagon. If I don't intervene, the remaining Bosmer will be slaughtered. Defeat the Infernal Guardian and the Warden of the Shrine. Defeat the enemies at the Central Barricade. Follow the path through the tree, then head to the area where the surviving Bosmer have gathered. Talk to Gilraen. "I'd welcome you to Whisper Grove, but it's little more than a city of ash at the moment." Gilraen says followers of Mehrunes Dagon set fire to the city and opened an Oblivion Gate. The villagers may not be able to save the city, but they will try to close the Oblivion Gate. You offer to hold off the Daedra on the north and south fronts. If you ask her for spare warriors, you can pick Laeneval, a healer, or Elolir, a longbowman. Talk to one of them after finishing the conversation to bring him or her along. You need to defeat the Infernal Guardian to clear the north front and the Warden of the Shrine to clear the south front. The Infernal Guardian is in the vine structure in the northern part of the dungeon. He is a fiery lurcher guarded by Dagonite enemies. After defeating the Infernal Guardian, go south through the city. You can choose to change to a different spare warrior at this time. Golor the Banekin Handler will be at the top of some stairs standing in the light along with three banekin. Defeat Golor and his banekin, then go up the path to the northeast. When you reach the top, a flame appears and the Warden of the Shrine teleports in. Go back to the central barricade, where you talked to Gilraen to start the quest. When you arrive you will need to start killing enemies. 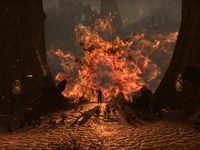 The most challenging enemy in this part is the Dark Ember, a powerful flame atronach. Talk to Gilraen after you defeat all the enemies. She says the Oblivion Gate is through the barricade and defended by Razor Master Erthas, the leader of the Dagon Cell. You can ask her for more information about Erthas: he convinced the community that the Aldmeri Dominion was dangerous and to build the city. You can also ask her about the man on the ground, her husband Fingaenion. He was injured in the Daedra attack, but Laeneval healed him. Head through the wooden barricade southeast. This is the long, skinny path on the map. On the way, you encounter Rothariel Flameheart. Defeat her, then open the door to the City of Ash. Approach the Oblivion Gate. It emits flames as Razor Master Erthas steps out. "Your hide will make a wonderful rug for the master. Surrender and I'll devour you quickly." Once you defeat him, Gilraen will run up to the center. Talk to her. "I didn't think we'd survive this day. Many have died, but some live. Thank you for fighting on our behalf." "In time, our city will recover. Perhaps we'll parley with the Dominion and return to our people. But for now, we'll have our hands full trying to close this damned Oblivion Gate." She gives you the Grove-Watcher's Brigandine, a skill point, and some gold. After you complete the quest, Mehrunes Dagon speaks to Gilraen. Mehrunes Dagon: "I'm beside myself. You truly believe you've won. I didn't expect your little friends there could kill Erthas. But I stand corrected. All this trouble because of one Bosmeri woman. You are Gilraen, of the Whisper Grove, are you not?" Gilraen: "I am. Are you … Mehrunes Dagon?" Mehrunes Dagon: "It was you who rallied this peasant village to contend with me. Fascinating that a mortal could be so troublesome. I need a replacement for your Erthas. Come. Meet with me, and I will close this Oblivion gate, spare your people." Gilraen: "I think...I think I have little choice. Tell the others to get as far away from here as they can." She runs into the gate, and it closes behind her. You can talk to her husband, Fingaenion, who appears after she has left. "My wife—where is my wife? Where is Gilraen?" Gilraen agreed to meet with Mehrunes Dagon in exchange for closing the Oblivion Gate. "She ... she left me? She always did put the needs of the community above her family. I suppose I'll have to respect her wishes. And she'll have to respect that I'll tear down the fabric of reality to get her back." "Our home here won't last. Not with the damage that's been done. Gilraen would want me to get everyone to safety. I'll return them to the Dominion—maybe they can help me get my wife back. Think I saw a copy of "On Oblivion" at home..."
To help the Bosmer, I should clear the northern and southern fronts of their battle against the Daedra. I have defeated the Daedra at both the northern and southern fronts of the battle. I should return to the central barricade and speak to Gilraen. I've defeated the Daedra attacking the central barricade. I should speak to Gilraen. Gilraen has tasked me with confronting and defeating the leader of the Dagon Cell that has attacked her home. Finishes quest I must speak with Gilraen again.